FILE - An electric driverless shuttle is tested in Paris, Nov. 17, 2017. 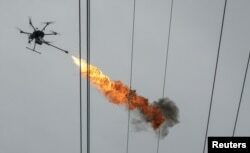 FILE - A drone emits flame to burn down trash from power lines, in Haikou, Hainan province, China, Nov. 16, 2017. "We ultimately ended up with a lot more questions than answers," Brundage said. Can Someone With No Heart Know Love?